Today I unveiled a new breakfast recipe at our house via Gooseberry Patch’s Comfort Foods. I’m giving away one copy of this cookbook in a few weeks through the Real Farmwives of America. But first I am cooking my way through the cookbook. My family couldn’t be happier. It kicks me out of my summer time cooking rut and lull. Brown Sugar Baked Oatmeal is a recipe that I will be making often now. I decided it was time for a new breakfast after our son yesterday ate 8 fried eggs (he whipped up himself), 3 pieces of cheese, 4 pieces of toast with peanut butter, a banana, glasses of orange juice, water and his sisters’ fruit snacks. Thumbing through my new cookbook, I found an alternative for our son this morning before he was going to work with my husband. This Brown Sugar Baked Oatmeal recipe is easy, fast and a warm nutritious breakfast. Start with ingredients you probably have around your kitchen already. I set out dry ingredients last night on the counter to be a little more organized this morning. I also set out the butter to softened. This morning at 5:45AM when my alarm went off it made for an easy recipe to whip up and was in the oven before 6AM, just in time for me to drink coffee on my deck and watch the prairie sunrise. Preheat oven to 350F. Start by blending 1/2 cup brown sugar with 1/2 cup butter. I made 1 1/2 times the recipe for a larger pan of the baked oatmeal recipe. I have big eaters to feed. But what I am listing and showing you below is the listed recipe and serves 4-6, normal eaters. The recipe also listed that you could replace the 1/2 cup brown sugar with 1/2 cup honey. We get honey from our honey bee farmer friends and I am sure I’ll make this again with honey. Add in 3 cups of oatmeal. Add 2 tsps of baking powder. Blend and stir all ingredients together. Optional is to add nuts and/ dried fruit. I added 1/2 cup of chopped almonds, straight from my almond farming friends, Brooke and Brent at 4G Farms who always seem to get me almonds when I visit California for work. I also 1/2 cup of dried cranberries that are listed as “blueberry juice infused”. Very yummy. The recipe calls for a 8″x8″ greased pan. I used a bit larger pan because of increasing the recipe. During the 30 minutes this morning, I drank a few cups of freshly ground and brewed coffee on our deck and laughed to myself at how I despised the oatmeal my dad forced me to eat for 15 years of my life. My dad’s argument was that it was heart-healthy and economically made sense. I clearly remember him telling me oatmeal was 3 cents a serving versus Frosted Flakes (my childhood choice breakfast cereal) was 22 cents a serving. And here I was this morning up at sunrise making oatmeal for my family. I know my dad used to get up early to make oatmeal. He also had his quiet times then. He still does this routine. I had my own quiet time at sunrise this morning. My coffee, the birds, the solitude and tranquility were superb. I think this may become a new routine. When the Brown Sugar Baked Oatmeal was done, I spooned up bowls for my husband, son and myself, putting a tsp of honey and a little milk on each helping. Nathan added while we ate on the deck, “this makes me feel like I’m on vacation for 10 minutes before the horrid last week of July begins.” Being a small business owner right now is long, hard days and the last week of any month means long nights of billing and invoicing for Nathan. Brown Sugar Baked Oatmeal makes for a hearty recipe to get us through the hard working hot summer days and certainly will warm our souls on cold winter days. What’s your breakfast routine? What’s your favorite recipe to make for a morning meal? 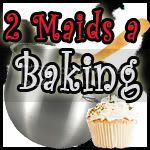 Linking up today for my friend Liz’s Two Maids a Baking linky party. If baking oatmeal counts as baking then I am in on this party! · Special thanks to Gooseberry Patch for providing me with this great cookbook to try and share with you. If you would like to purchase this or other cookbooks, please visit their store. 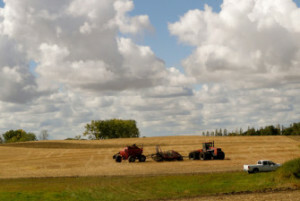 If you would like to see other great recipes, check out www.realfarmwivesofamerica.com . 1) Your son is a great eater, I’m proud of him. 2) I bet your grocery bill isn’t so proud of him. 3) I like Farmer Fred’s math skills – he’s a great consumer/dad/tall person. 4) I would love to make this but I’m far too lazy, I’m a big fan of pouring oats in a bowl, pouring water onto these oats, and microwaving them for roughly 1:30. Great post – love the detail of the pictures and the process and of course the story behind it all. Nice work! Oh this sounds delicious! I am definitely going to try this SOON! This does look good and would be a nice supper (with fruit) during the winter months too. We love having breakfast for supper. Love it, Katie!! Will be trying this recipe with my two big eaters…!! sounds health and yummy!! I love this recipe so much. I could eat the whole pan by myself in a couple days. I love finding wholesome meals to make for my family too. I’ve made this one more than I can count. Thanks!